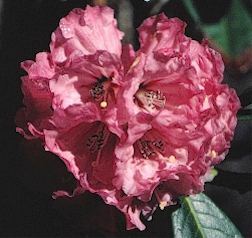 Flower/Truss Description: Oblique campanulate, pale rose to crimson-purple, fading paler, may have small blotch. Truss holds 20-30 flowers. Foliage Description: Leaves elliptic to oblanceolate, up to 22" long, lower surface glabrous in juvenile state, developing buff indumentum as plant matures. Height: 6 feet in 10 years.